Summer 2015: Benz Lab (left to right) Mia Ivos ('18), Dr. Fangyuan Tian, Kendall Kehr ('16), Prof. Benz, Amber Mosier ('15), Bette Webster ('15), Emily Pitsch ('18). Last summer hurrah for Dr. Tian, who is heading to Cal. State Long Beach to begin a faculty position! We will miss you! Best of luck! May 2015: Congratulations Benz group graduates! Bette Webster (left) is heading to graduate school at Stanford University to pursue a Ph.D. in Biochemistry, Amber Mosier (center) will attend UCSD to pursue a masters degree in Chemistry, and Hanna Larson (right) is on her way to earn a masters degree in Global Health from UCSF. Good luck!! 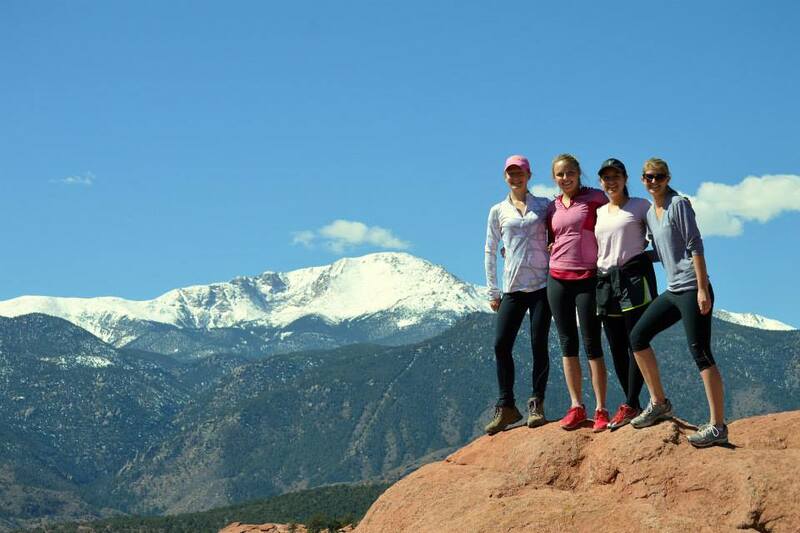 March 2015: The Benz lab in Denver, Colorado for the spring ACS meeting. Nice job on your poster presentations Bette, Amber and Hanna! August 2014: Prof. Benz (left) and Bette Webster ('15, right) at the Beckman Symposium. Congratulations, Bette, on your Beckman Scholar Award! May 2014: Congratulations Benz group graduates!! Ryan Shine, Aileen Park, Brian Benedicks and Andrew Cerro all graduated this year. Ryan will attend medical school in the fall at UCSD, and Brian was officially commissioned in the Navy. Aileen is taking a year to travel and volunteer before applying to medical school, and Andrew will continue his work in the lab this summer, and plans to apply to industrial positions. We wish you all the best of luck!! April 2014: Bette Webster ('15, pictured above during her study abroad experience in New Zealand conquering Avalanche Peak) is awarded a prestigious Beckman Fellowship to investigate the role of surface groups in reactivity studies of ZIF-8 nanoporous materials. Congratulations Bette! March 2014: At the American Chemical Society conference in Dallas, TX! Picture on left (from left to right): Dr. Tian (Postdoctoral Fellow), Dr. Benz, Amber Mosier ('15), Andrew Cerro ('14) Picture on right: Dr. Benz receives a 2014 ACS WCC Rising Star Award. The awardees for 2014 are pictured above (right) at the award symposium in Dallas. Thank you everyone for your support! September 2013: The group welcomes our first Postdoctoral Fellow, Dr. Fangyuan Tian! Dr. Tian comes to us from the Teplyakov lab at the University of Delaware where her work focused on the modification of silicon surfaces for use in electronic devices. We look forward to working with Dr. Tian! April 2013: At the American Chemical Society Conference in New Orleans! The Benz group presents their work: Upper left: Aileen Park ('13) and Bette Webster ('14). Upper right: Brian Benedicks ('14) and Dr. Benz. Nice job everyone! 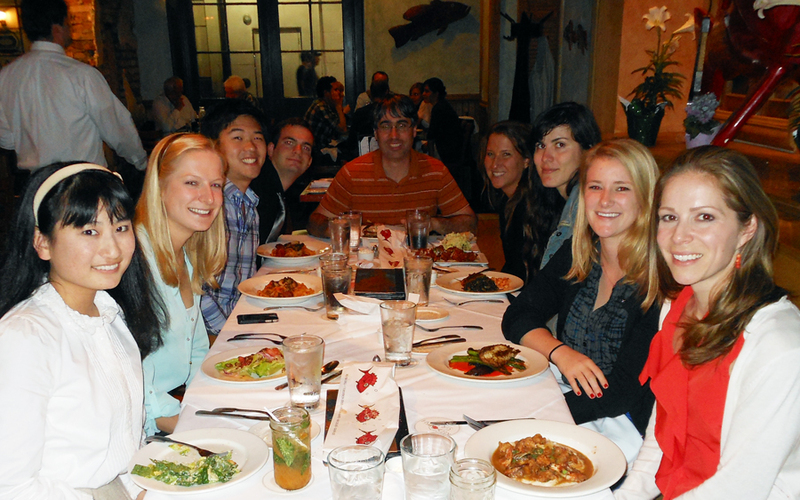 USD celebrates at a group dinner---can't beat the food in New Orleans! December 2012: Professor Benz receives word that the NSF will fund her CAREER proposal. What a great way to start the New Year! Congratulations all around to the group for the hard work that went into this. March 2012: Michelle Mezher ('12) and Aileen Park ('14) received an award for the presentation of their work on petroleum-based organosulfur compounds from the Division of Colloid and Surface Chemistry at the March 2012 national American Chemical Society conference in San Diego. This award recognizes excellence in research, and was given out to only five of approximately 150 posters presented during the session. The award included dinner at Donovan's steakhouse and an award luncheon with several top researchers in the field, as well as a cash prize of $250. Way to go Michelle and Aileen!! Left: Michelle (L) and Aileen (R) standing in front of their poster at the ACS. Right: Awards ceremony. Professor Vicki Grassian (center), Michelle and Aileen are the first and second from the right, respectively. 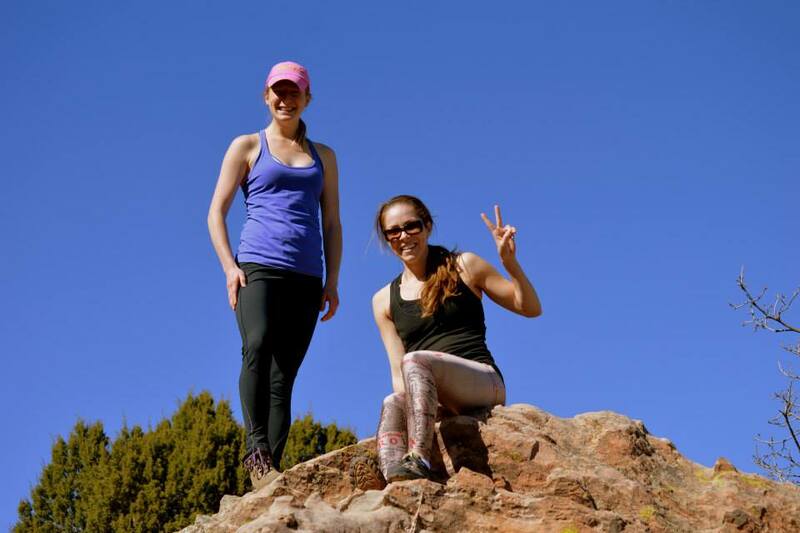 May 2011: Congratulations to graduates Aliza Cruz and Karen Cesafsky! Aliza has gone on to pursue a masters degree in education at USD, and plans to become a high school chemistry teacher. Aliza was involved in the early development and testing of the Benz group vacuum chamber. Karen is currently employed full-time as a research associate at Millenium Laboratories in San Diego, and plans on applying to graduate school for a start date of Fall 2013. 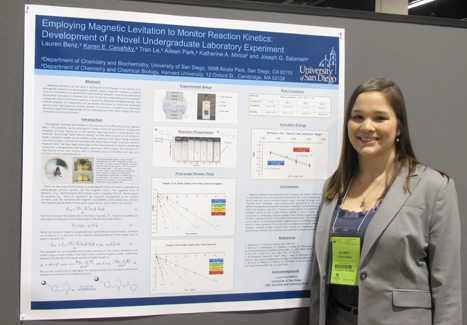 Karen's undergraduate research focused on the application of magnetic levitation in a laboratory experiment for the measurement of the kinetics of a solid state reaction. Aliza Cruz (left) and Karen Cesafsky (right) enjoying some sun as we waited to have lunch in Anaheim at the ACS conference in March 2011. March 2011: Karen Cesafsky presents her work at the American Chemical Society in Anaheim, CA. Following interviews at the ACS Karen received several job offers. Nice job Karen! !